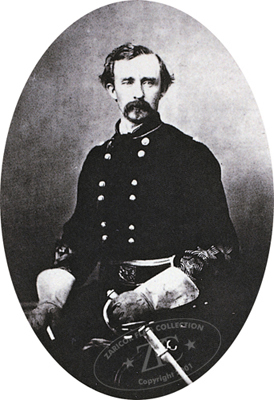 General George A. Custer wearing a double breasted jacket that he designed and had tailor-made for himself in the Autumn of 1863. General George Custer commanded the 3rd Cavalry Division in 1864 thru the end of the Civil War 1865. This flag served with Custer during this period along side his Personal guidon (see ZFC0489). A photo of this flag along with Custer's Personal Guidon can be viewed in ZFC1492 with George and Libby Custer and his staff in front of his headquarters outside Winchester, VA. The flag shows heavy battle damage and souvenir taking by Custer's officers. There are 4 bullet holes in the flag. This flag also served with General Wilson prior to Custer taking command of the 3rd Cavalry Division in 1864. A veteran relic from numerous illustrious Civil War battles. 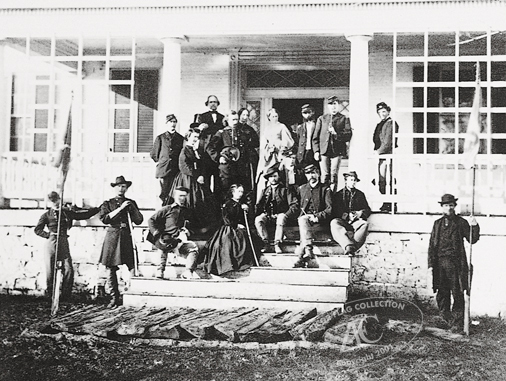 Major General George A. Custer's Headquarters with his two guidons, Winchester, Virginia, December 25, 1864. In 1864, when General Sheridan headed East with General Grant and assumed command of the Cavalry Corps of the Army of the Potomac, he instituted a special headquarters flag for the commanders of each of his three cavalry divisions. The flag emulated the pre-War cavalry guidon in that it was swallow-tailed in form and divided horizontally, red over white. On each of the two horizontal bars, the respective division number was applied in the color of the opposite bar. Brigadier-General James Wilson initially commanded the 3rd Cavalry Division of Sheridan's Cavalry Corps. In September of 1864, however, Wilson was transferred to the western theater to command his own Cavalry Corps. Brigadier-General George A. Custer then assumed command of the 3rd Cavalry Division and commanded it until the close of the War. Custer's orderlies carried this flag along with his own personally designed flag with Custer in the campaigns that followed, until the 3rd Division flag became too worn for further use. Wright, Horatio, editor, Flags of the Army of the United States Carried During The War of the Rebellion 1861-1865, To Designate the Headquarters of the different Armies, Army Corps, Divisions and Brigades, or "Designating Flags of the United States Army, 1861-1865", Philadelphia, Burk & McFetridge, 1887/1888. P. Gen Custer's Flags. Katz, D. Mark, Custer in Photographs, New York, Bonanza Books, 1985. p .35. Merington, Marguerite, editor, The Custer Story: The Life and Intimate Letters of General George A. Custer, University of Nebraska Press, Lincoln,1987, Pp.140-141. Madaus, Howard M., Dr, Whitney Smith, The American Flag: Two Centuries of Concord and Conflict. Santa Cruz: VZ Publications, 2006, p. 85. Schrambling, Regina, "A Lifelong Pledge." Collection, Published by Robb Report, June 2014, p. 48H. •	General George A. Custer, 3rd Cavalry Division, Cavalry Corps of the Army of the Potomac until 1865. •	Retained by Lt. Colonel (Brevet Major General) G.A. Custer until passing, 1876. •	By descent in the Nevin Custer family to G.A. Custer grand nephew, Colonel Charles A. Custer. •	Sold by private treaty to Mr. Alexander Acevedo, The Custer Collection, New York, NY. •	Sold via Butterfield & Butterfield Auction House of San Francisco, CA, to the Zaricor Flag Collection, 1995. Merington, Marguerite, editor, The Custer Story: The Life and Intimate Letters of General George A. Custer, University of Nebraska Press, Lincoln,1987, pp. 339. Madaus, H. Michael, The Personal and Designating Flags of General George A. Custer, 1863 - 1865, Spring 1968, Military Collector and Historian, Washington, DC. Howard M. Madaus, C.W. Vexillological Services, Cody Wyoming, to Mr. Ben Zaricor, Santa Cruz, CA, 290 April 1995, Zaricor Flag Collection Archives.